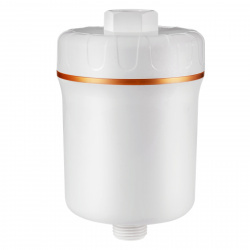 This is the replacement filter cartridge for iSpring 5-stage Shower Filter which generates clean water from tap water. The unit removes a variety of contaminants including chlorine, bacteria, arsenic, heavy metals (lead, mercury, cadmium), hydrogen sulfide, THMs, MTBEs, VOCs, Chloramine, sodium, nitrate, microorganisms and scale, protecting your hair, skin and over all health. It also reduces lime, scale, mold and fungi in showers. It also balances pH of water. If you are looking to make your shower water healthier and cleaner at a reasonable cost, this filter is for you! Size: Diameter 1.5 IN. by 6.5 IN.